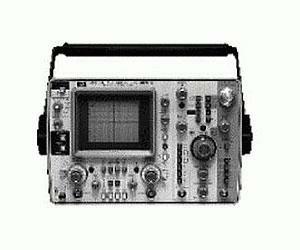 The HP Agilent 1744A Storage Oscilloscope provides a "one oscilloscope" solution to the wide variety of measurements encountered daily. Its extremely fast 1800 cm/µS variable persistence and stored writing speed with minimum blind time and auto-intensity circuitry adds to its superior capabilities. It offers dual channels, 5 mV to 20 V/div vertical sensitivity, and 100MHz bandwidth. Main sweep speeds from 50 ns to 2 s/div and delayed from 50 ns to 20 ms/div, plus flexible triggering (including a 3rd channel trigger view) and selectable input impedance are also provided.